Desperation In Puerto Rican Town Where 60 Percent Are Now Homeless In Cataño, near San Juan, the storm left hundreds living in a shelter where conditions are becoming increasingly dire. 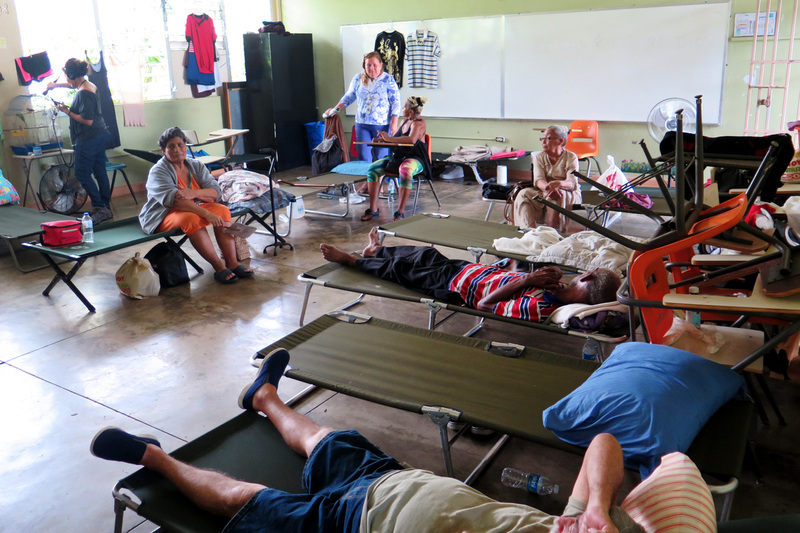 Carmen Rivera (at left in the orange dress) sits on a cot at the Cataño shelter. She suffers from severe asthma and knee pain and has had to be rushed by ambulance to the hospital for asthma treatment twice since the hurricane. She says she feels forgotten by authorities. Irma Rivera Aviles, like nearly 200 others, is stuck at a shelter in Cataño, Puerto Rico, where conditions are getting worse daily. Nearly a week after Hurricane Maria rampaged through the country, she's desperately pleading for help. "The governor needs to come here and take a look at our critical situation," she says. "The bathrooms flooded and aren't working, sewage is overflowing, the generator is broken and we are here in the dark." "We desperately need water, power and ice," she says. In Cataño, a small town near San Juan, about 60 percent of the population of 27,000 is now homeless and the "situation is extremely precarious," says utility supervisor Hector Merced. "Cataño is devastated; it's flooded," Merced says. The water rose quickly when Hurricane Maria hit last Wednesday. Cataño is a low-lying community on Puerto Rico's northern coast on the Bahia de San Juan. Many in the town don't have a lot of money and rode out the storm in the temporary shelter, where conditions are becoming desperate. 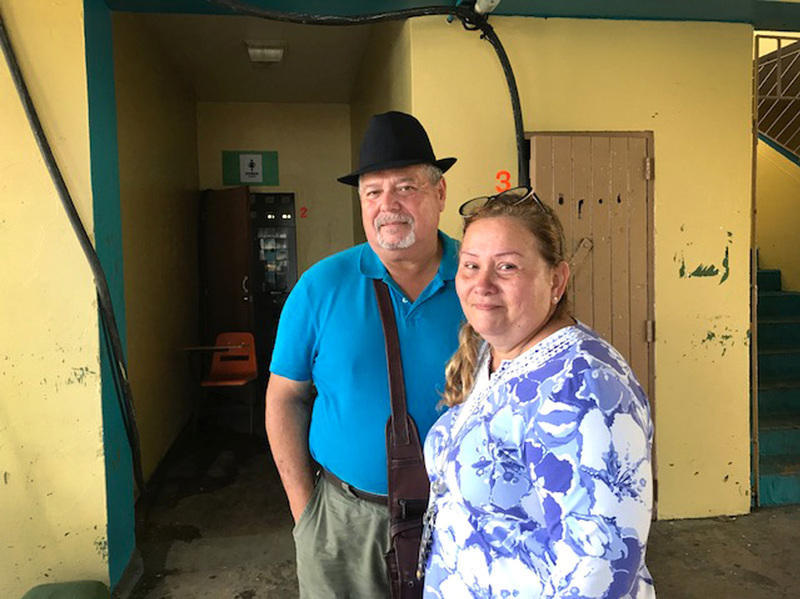 Irma Rivera Aviles and husband Ivan Martinez's home was severely damaged by Hurricane Maria. The couple are now staying at a shelter, where Rivera Aviles says, "the situation here is critical." Rivera Aviles, a Cataño city council member, helped set up the shelter at the Ramon B. Lopez vocational school. She and her husband evacuated before the storm because their house — made of wood — is close to the water's edge. After Maria passed she returned home and was shocked that "the entire roof was blown off." "Everything got wet — the beds, furniture, everything," she says. The water damage has made it unlivable. Although there's food provided at the shelter, there is no running water. At night, she says, with no power residents are left in the dark and are awakened sometimes by the sound of gunshots nearby. But for Rivera and many others at the shelter, their biggest worry is health care. "My husband is a kidney transplant survivor," Rivera says, her voice trembling with emotion. "He's diabetic and we don't have ice to store his insulin." She opens a blue plastic cooler where she's trying to keep her husband's insulin cold. The medicines are inside a white plastic bag floating in water. "We desperately need ice," she says. Carmen Huerta, 67, has a hard time walking. Her health, too, is compromised. "I suffer from sleep apnea, diabetes ... high blood pressure, poor blood circulation and arthritis," she says, adding that her 74-year-old husband is not well either. She says he has Alzheimer's, anxiety and prostate cancer. The couple are sitting in a scorching classroom on the ground level at the shelter. The pungent odor of sewage is overpowering. They came to the shelter on Tuesday before the storm. Huerta pulls her long skirt up and shows her red, bursting ankles. "See how swollen they are," she says, adding that she spent four days "sitting on my walker" until a brown lazy chair was donated. She says she wants to go home to the Barriada de Juana Matos area of Cataño. With her eyes filling with tears she says, "They treat me well here, but I'm very uncomfortable." Authorities in Puerto Rico say there are more than 10,000 people in shelters across the island because their homes were destroyed by Hurricane Maria. FEMA and relief groups are delivering food, water and generators to the island, but in Cataño, they say so far no outside help has arrived. Nearly a week after the storm, some areas here are still flooded. Maria Escalera, 77, calmly pushes her walker through water to her shins. She says she has enough food and water at home, but wanted to check on her nephew, whose house is in the flooded area. 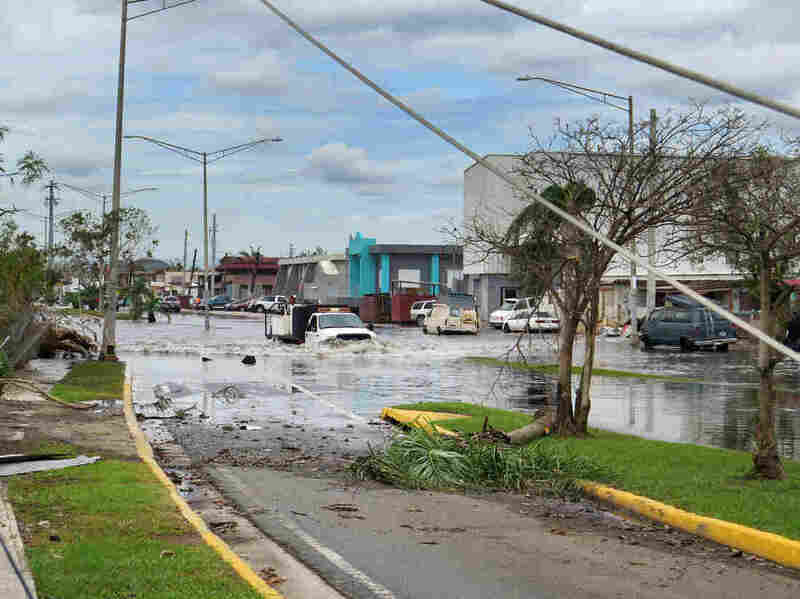 Nearly a week after the Category 4 Hurricane Maria hit Puerto Rico, some areas, including the small, low-lying community of Cataño, are still flooded. "I was worried to death not knowing if he was OK," Escalera says. "His house lost its roof and he has a lot of water damage." She's thankful she and her husband, who is blind, are alive. She also lost her dentures in the storm. Outside the Cataño Mini Market, a line stretches around the building as customers are allowed in five at a time. Malena Quiñones is in line, and though it is hot and muggy, she's thrilled because the word is out — banks are slowly back online, their debit cards are working, even if off and on, and they can buy badly needed supplies. Today she's hoping to buy "bread, cheese, ham, everything you need. We have water." She, too, is thankful she and her five kids are alive. In San Juan, there are lots of lines now — lines of cars at gas stations waiting for tank trucks to arrive and gas to begin flowing again. Long lines form outside banks, where people for the first time since the storm have some chance to withdraw cash. Along the sides of highways, cars line up in places motorists have found good cellphone signals. The government here reports some signs of progress, too. Water is slowly coming back in some areas. One of the most hopeful signs — Puerto Rico's power authority says it has restored electricity to two big hospitals in the San Juan area. And power is back on in part of Mayaguez, a city on the island's west side, far from the small town of Cataño.